It’s official: I will finally get my shot at FCF Champion “Wildman” Heimo Ukonselkä at Fight Club Finland’s Jatkosota 2012 event on Friday, April 20th in Helsinki. To say that this match has been a long time coming would be arguably the understatement of the year. Ukonselkä has been a strong champion, thwarting all challenges to date, coming out on top like the king of the kill. 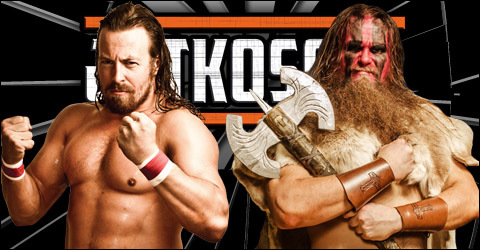 However, on April 20th at the Old Student House, smack-dab in the heart of the nation’s capital of Helsinki, Heimo Ukonselkä is up against one of the top professional wrestlers on the continent of Europe today. Get your tickets early, this event WILL sell out. To quote the legendary Four Horsemen member Arn Anderson, “I hate to toot my own horn, but TOOT, TOOT!!”. Heimo Ukonselkä, along with everybody else knows, that StarBuck is not only a 4-time FCF Champion, I am also a 3-time European Champion, a 2-time Italian Champion, the first SMASH Champion in Japanese history, along with being a German tag team champion. I have faced the best of the best worldwide in 17 countries over 17 years in the game. From legends like Japan’s Genichiro Tenryu to multi-time European Champion Bernard Vandamme of Belgium to greats like former ECW World Champion Steve Corino, they have all fallen to Yours Truly inside of that squared circle. Heimo Ukonselkä, the “Wildman” and current FCF Champion, is next on that long, elusive list.